"The 'no smell' fish recipe that is the ONLY one I make for my family (I hate fish, they LOVE it!). Take foil packets to table for service, and keep them around for the discarding of bones and skin. Then when dinner's done, haul those babies to the outside trash." Preheat oven to 400 degrees F (200 degrees C). Rinse fish, and pat dry. Rub fillets with olive oil, and season with garlic salt and black pepper. 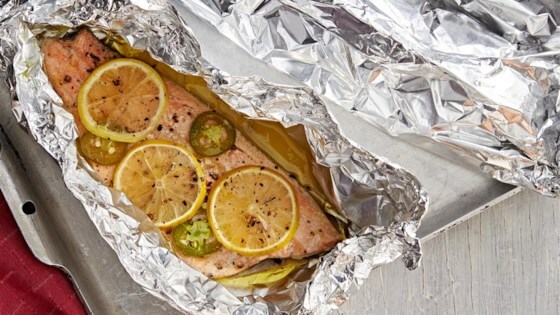 Place each fillet on a large sheet of aluminum foil. Top with jalapeno slices, and squeeze the juice from the ends of the lemons over the fish. Arrange lemon slices on top of fillets. Carefully seal all edges of the foil to form enclosed packets. Place packets on baking sheet. Bake in preheated oven for 15 to 20 minutes, depending on the size of fish. Fish is done when it flakes easily with a fork. I used green peppers and green onions instead of the jalepeno, but it was excellent. Fish was tender, no fuss, no muss. Foil rules! I don't like a lot of fish but this was goooooood! it was a tiny tad too watery so I'll probably vent the foil next time but overall it was great.